David Thonnard 5 months, 1 week ago. LineageOS 15.1 for Moto X Pure (style) (clark) is now available to download via an EXPERIMENTAL development build. 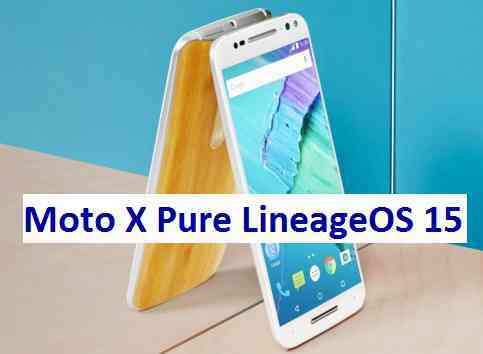 This post provides the download link to the Android Oreo based Lineage OS 15.1 for Moto X Pure (style) (clark) and guides through the installation process of the same. This LineageOS 15.1 for Moto X Pure (style) is brought to you by developer HashBang. No donation link found for HashBang. If you want the OFFICIAL Lineage OS 15.1 update or some more Android Oreo ROMs then stay tuned to the LineageOS 15 ROM page or the AOSP Oreo ROMs devices list page. THIS IS AN INITIAL BUILD WHICH MAY NOT BOOT AT ALL. HAVE A BACKUP BEFORE FLASHING THIS AND TRY AT YOUR OWN RISK. Installing a custom ROM requires an unlocked bootloader on Moto X Pure (style), which may VOID your warranty and may delete all your data. Before proceeding further you may consider backup all data on the phone. Understand that you are the only person making changes to your phone and I cannot be held responsible for the mistakes done by you. – Here is the TWRP update guide for Moto X Pure (style). This recovery guide requires an unlocked bootloader on the phone. Reboot and Enjoy Android Oreo with LineageOS 15.1 for Moto X Pure (style). Copy the latest Lineage OS 15.1 for Moto X Pure (style) Oreo ROM ZIP file to the phone. Stay tuned or Subscribe to the Moto X Pure (style) (clark) forum For other Android Oreo, Nougat ROMs, LineageOS 15.1 ROMs, other custom ROMs and all other device specific topics. After flash the latest release( my device is a xt1572 DS), I verified when sim cards are not recognized and rear camera not working, only the front camera. When I can follow release modifications? It’s possible hashbang create an changelog for releases stored in android file host? Was curious if not being able to use hotspot was an known issue with this version? Any other issue in last release? Sim cards are ok(I have 1572 DS version)? Any good news about camera? I have the 1575 version. No other annoying issues I can think of. Front camera is the only one that works out of the two. After testing the last lineageOS-version I wanted to go back to stock-nougat to have a working camera for vacations. However there was a problem with flashing the gpt.bin and bootloader.img. I got a “moto boot prevalidation flash (FAILED) remote failure” as a result. After researching the error on google I read about other people having this problem, but that it is possible to continue without flashing the bootloader. Indeed, the ROM booted succesfully and everything seemed to normal. After a while I noticed that the simcard wouldn’t be recongnized even after several reboots. It turned out that my phone had forgotten it’s IMEI and BASEBAND-numbers (Bootloader: “BASEBAND:<unknown>”, Settings: “IMEI: unknown”) I tried to reflash any of my TWRP-backups and reflashed both the stock- and LOS-ROMs but the SIM would not work again. I’ve read some guides on “how to restore IMEI/Baseband” but they all say “try flashing the stock ROM”. Is there any way of reflashing my current bootloader (version Ax0.52) to flash a full stock ROM or any other way to recover IMEI/Baseband-version? After flashing the ROM and GApps using TWRP, I reboot and all that comes up is a blue line with a blue circle going right to left repeatedly. It doesn’t progress further than this, even after multiple reflashes and using different versions of GApps, e.g. stock, full, super, micro. Any ideas why it shows this and how I could successfully boot? Using a 1572 version. Looks like it goes into bootloop after every flash. Can you flash only the LineageOS ROM file and not the GApps and see if the phone is booting correctly or not?